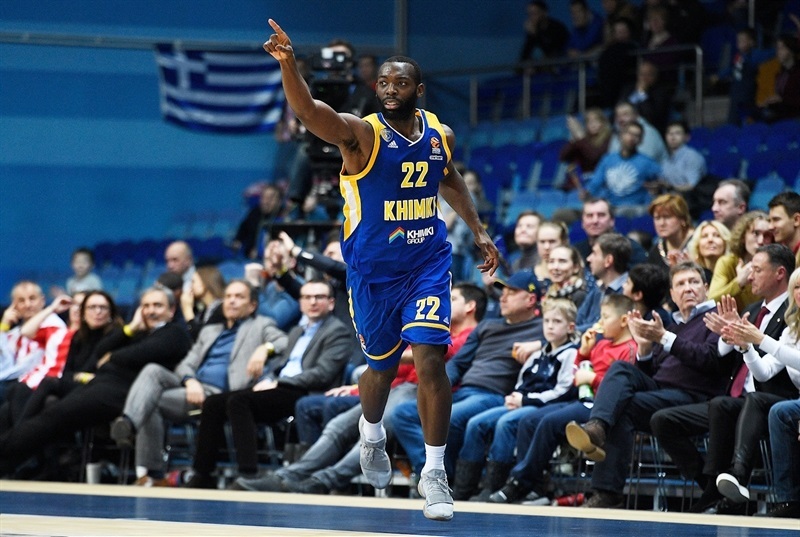 Khimki Moscow Region finished its first-ever double-victory week in style on Thursday by crushing second-place Olympiacos Piraeus 82-54 at home thanks to a pyrotechnic first half of scoring and consistently solid defense. 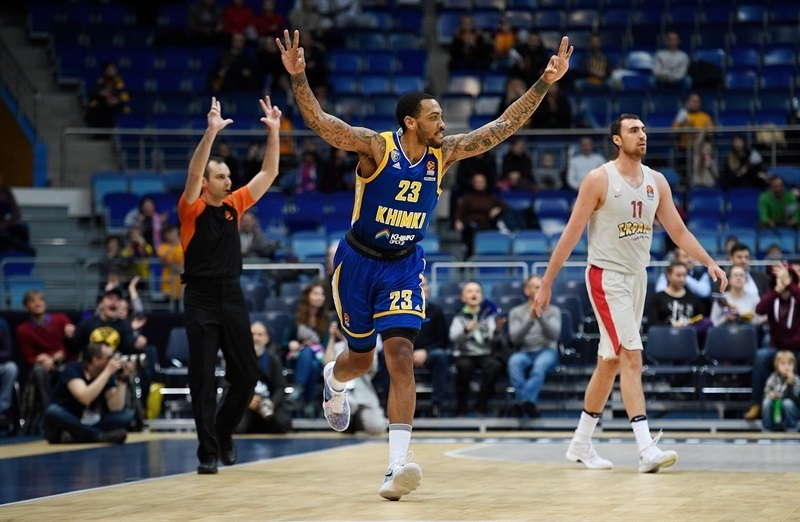 Against an Olympiacos team that allowed just 73 points per game to its first 18 opponents, Khimki led 49-25 at halftime, raised that margin to 27 points after three quarters and danced to victory. 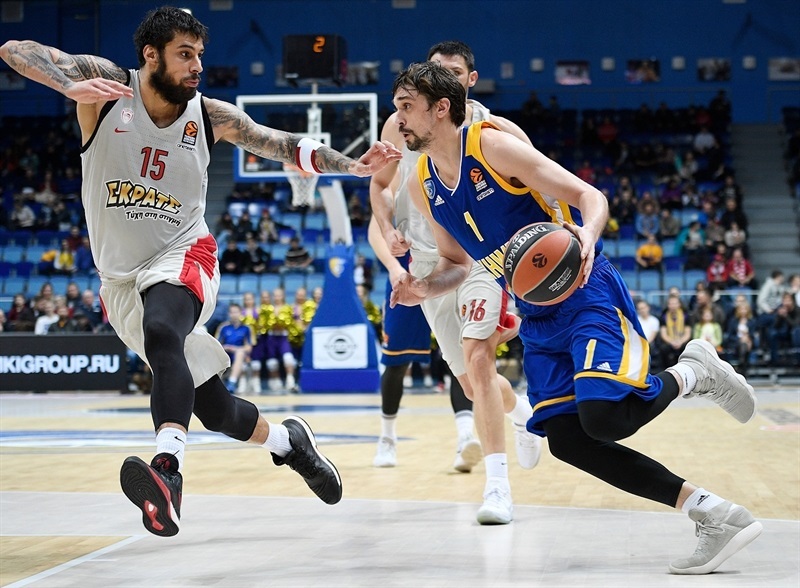 EuroLeague top scorer Alexey Shved had 19 points and dished 7 assists to lead the winners. Charles Jenkins matched his personal high with 4 three-pointers among his 16 points, while Malcolm Thomas scored 12. Olympiacos got 11 points from Kyle Wiltjer, all after the game was decided, and 10 from Janis Strelnieks, but was bested in every single statistical category except fouls. 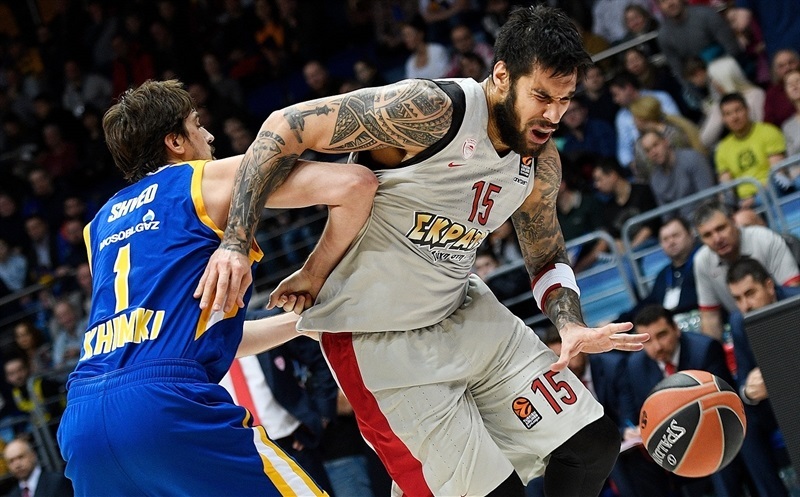 Khimki rose to 11-8 and solidified its seventh-place standing, while Olympiacos fell to 13-6 to jeopardize its exclusive hold on second place. Only free throws fell before Vangelis Mantzaris from long distance for the visitors and James Anderson inside for Khimki forged a 5-5 tie. 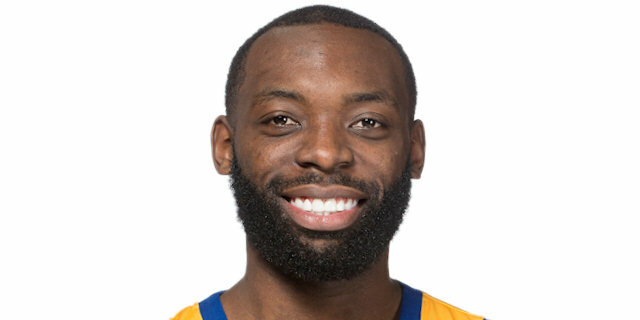 Shved found room for a triple and fed Jenkins for another before Thomas joined the fun to put Khimki up 14-5. Thomas scored next inside, then blocked Printezis and drilled another three-pointer. When Jenkins finished a fastbreak, it was 21-5 and the Reds needed their second timeout already. 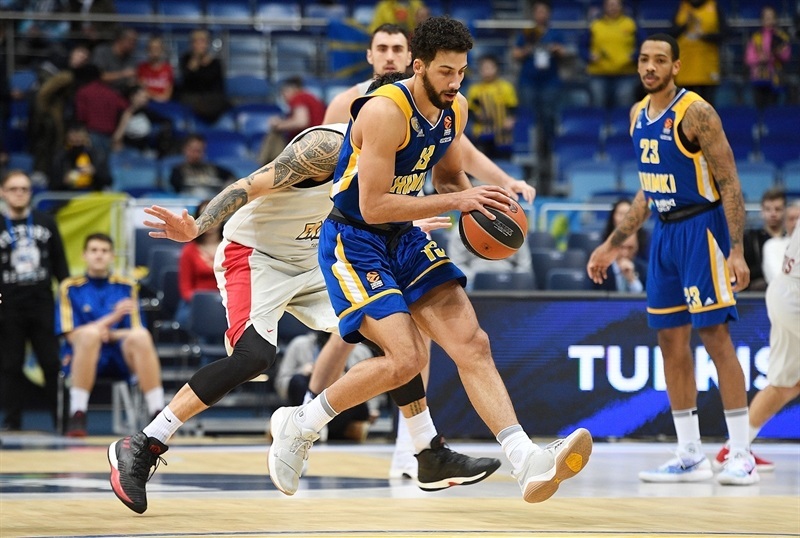 Georgios Printezis and Nikola Milutinov found a few points for the visitors, but Anderson canned a reverse layup and Anthony Gill a triple as Khimki coasted to the end of the first quarter up 28-14. 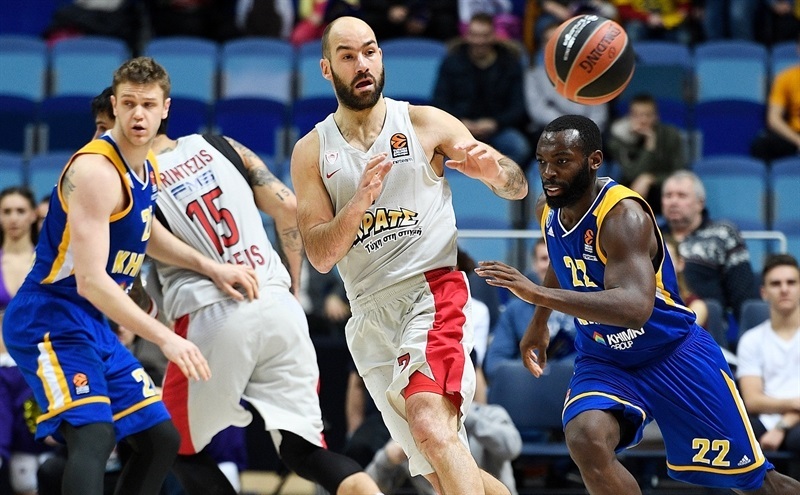 Strelnieks picked up the visitors with free throws and Ioannis Papapetrou scored, too, but Khimki never stopped racking up points as backdoor layups by Gil and Stefan Markovic led to Tyler Honeycutt hitting from long distance. 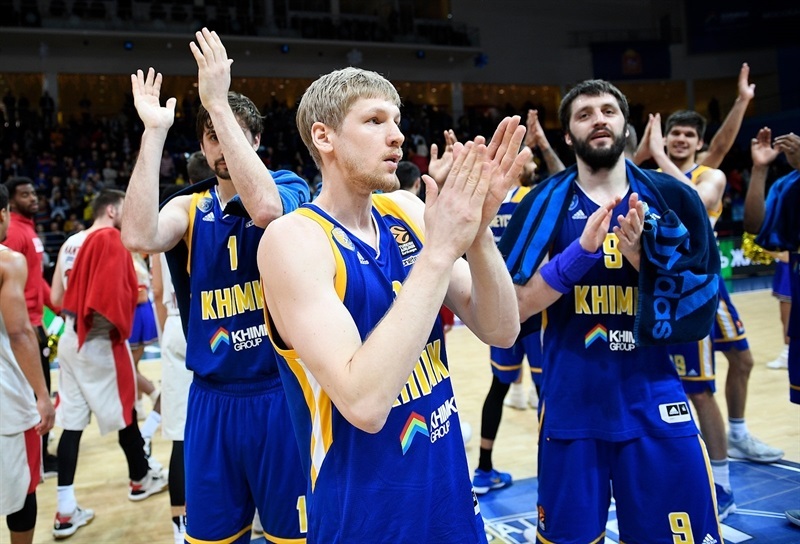 After Gill put back a miss and Egor Vialtsev hit an open three, Khimki had doubled Olympiacos at 40-20. 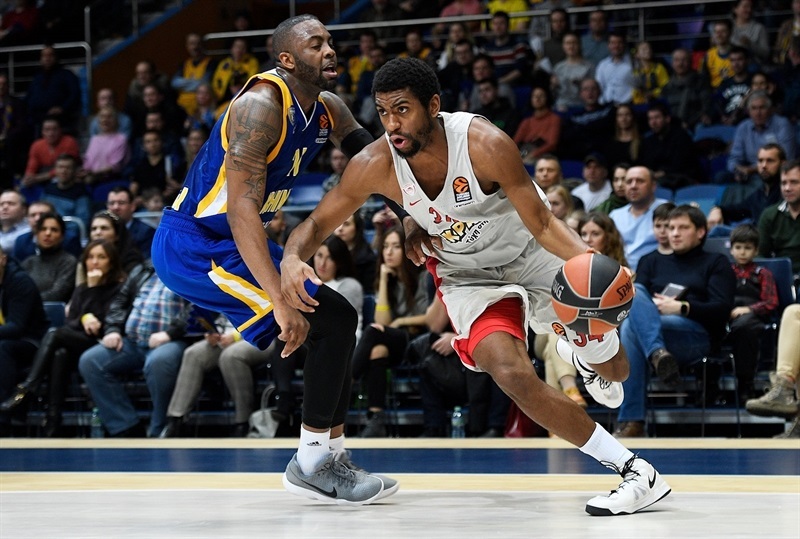 Jenkins was open next from deep, Marko Todorovic scored in close, and Anderson waltzed for a layup after the ninth turnover by Olympiacos as Khimki went to the lockers up 49-25. 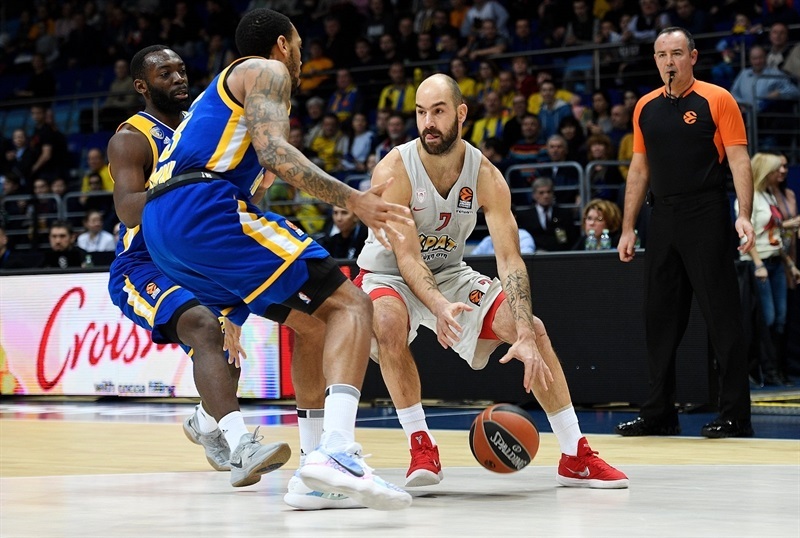 Thomas and Vassilis Spanoulis opened the second-half scoring with layups before Kostas Papanikolaou finished a nifty break at 51-29 for Olympiacos. Jenkins and Spanoulis traded triples and Papapetrou jammed a miss. Shved ended a drought from downtown and drove for a scoop shot to restore the halftime difference at 59-34. 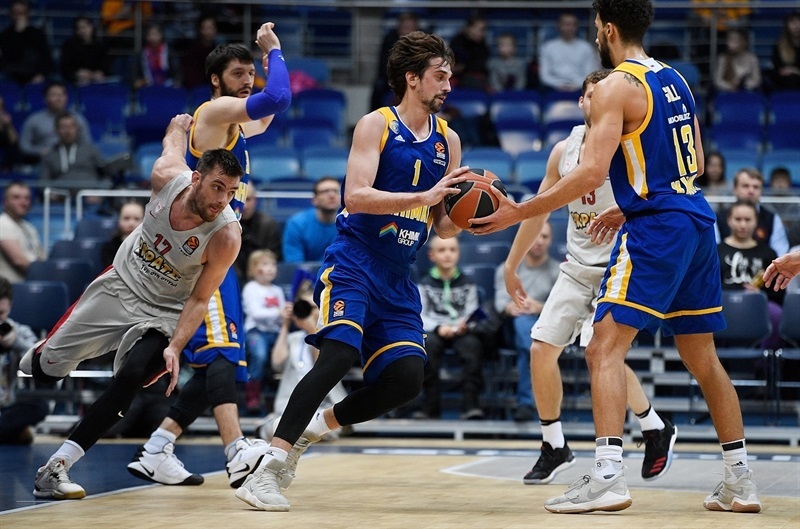 Printezis and Thomas exchanged jump-hooks, but Shved had a pair lightning-fast drives to post a then-high lead of 27 points, 65-38, after 30 minutes. Anderson and Jenkins picked up where Shved led off as the lead topped 30 points at 72-40 on the latter's three-pointer with 7:24 to play. 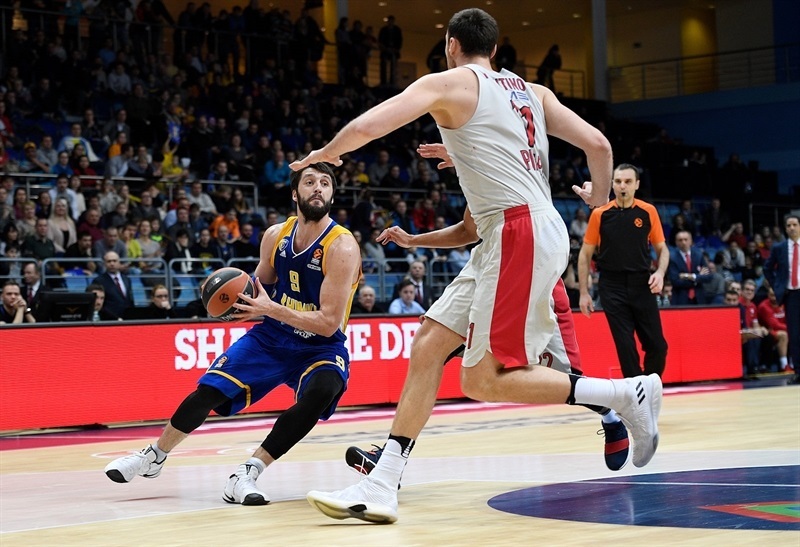 There was plenty of time, and Wiltjer made the best of it for Olympiacos, but otherwise Khimki's stellar defense did not stop working and the hosts made sure to preserve a wide margin in case it comes in handy when playoffs spots are decided. "Of course, I'm happy. If we consider the level of our opponents tonight, you have to be happy. We had two tough games, in Belgrade and today, against two strong teams. We have to be happy. I don't believe in luck. I believe only in team effort and today we had a good team effort." 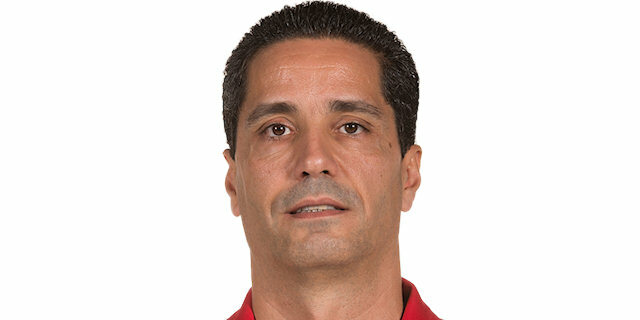 "I would like to congratulate our players, our coaching staff and the fans. It was a very important win for us, our second in the EuroLeague in this very busy week. We were very solid offensively and defensively; basically defensively. Olympiacos scored only 25 points in the first half. We had energy, we had concentration and played very strong defense in the first half. On offense, we had open looks and we executed with good percentages. In the end, we managed to win in a way that looks easy, but as I said, the players on Olympiacos never quit, never give up, so they were fighting until the end. So it was a very important win thanks to our players and congratulations to them." 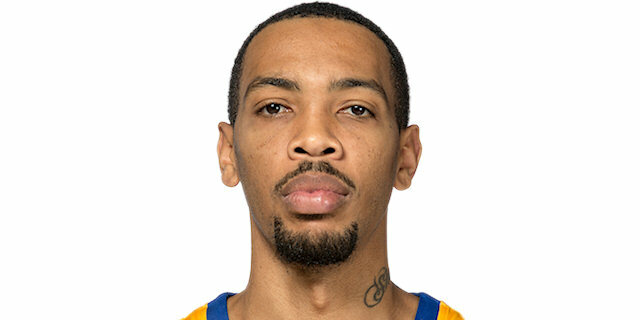 "I want to congratulate Khimki on the win. Tonight, they played much better from the beginning till the end. We started the game very bad; we didn't have concentration and were very bad on offense. The opponent read well what our defense gave them. From the other side, we let them score and play the game how they wanted, with fastbreaks and three-point shots. Although we knew this, we weren't ready to defend. But I believe there were problems on both ends of the court, not only defensively, but also offensively. 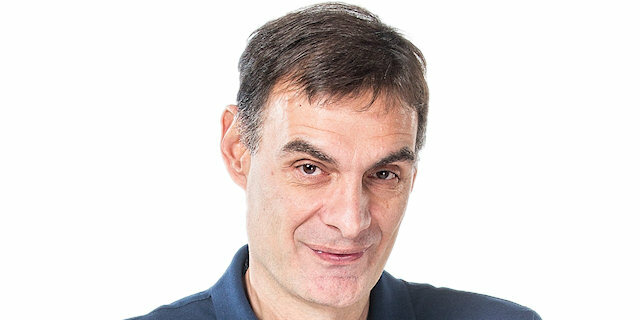 We played a second away game in a row very bad, and this is my responsibility to find the solution to change this [situation]. From the other side, we played four games in seven days and it's not easy to be focused and always have high energy for these four games." "It’s all about team defense. I think we did a really good job on defense. We knew that Spanoulis is a really good passer. Milutinov and Printezis have a nice relationship as far as they know what to do well on the floor. So, we did the best we could to make sure they wouldn't make any easy baskets at the start of the game. We rebounded the ball really well and went on transition. Overall, I think we just defended better than we normally do. Everybody was locked in, paying attention to details, and we played really well." "It's about Charles Jenkins, who set the tone first on defense, coming off screens and guarding Spanoulis. His defensive intensity really helped us today. I think it was more of us playing well, too. We moved the ball a lot, defensively we were talking and managed to take them out of what they were usually doing. We have to continue doing this in bigger games. We didn't think about points difference, as it was just important to win because they beat us previously. It was a good win for us."